For lack of a more apt description, the Toyota’s of a generation ago here were best labelled as appliances. Save for the 86, the rest of the line-up was uninspiring. They got the job done, nothing more and nothing less. Moving people and cargo from point A to point B didn’t necessitate stirring of the soul, hence it made do without. 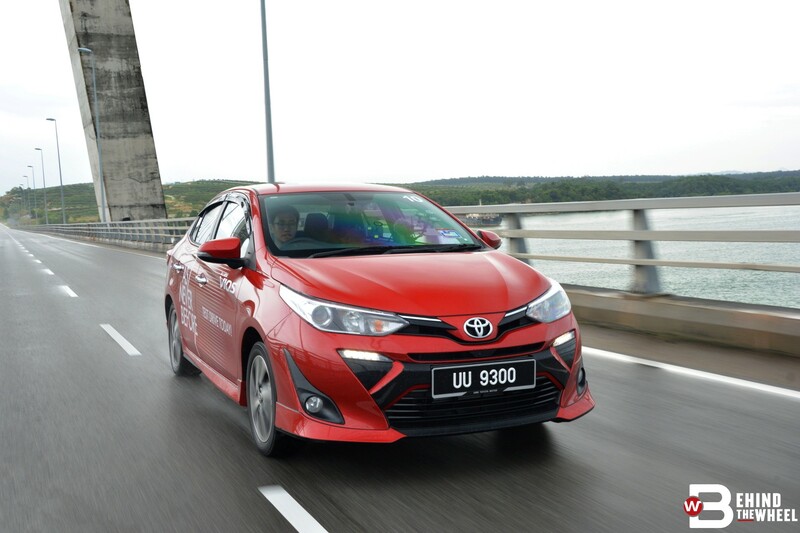 However, much like household appliances, the cars were dead reliable and that reputability was the fuel that kept the ship sailing although it fell behind its rivals in the ultra-competitive B-segment. 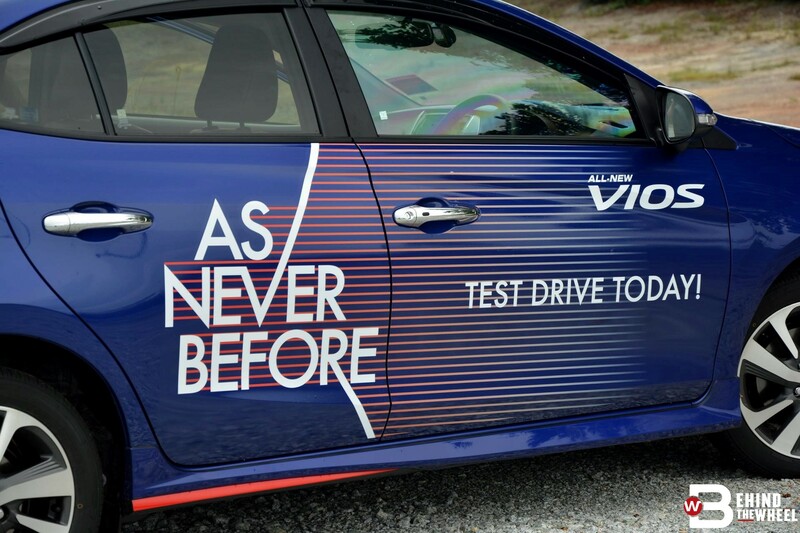 This was certainly due to the Vios failing to introduce significant upgrades with every new generation as RON-reputation kept the ship fueled. 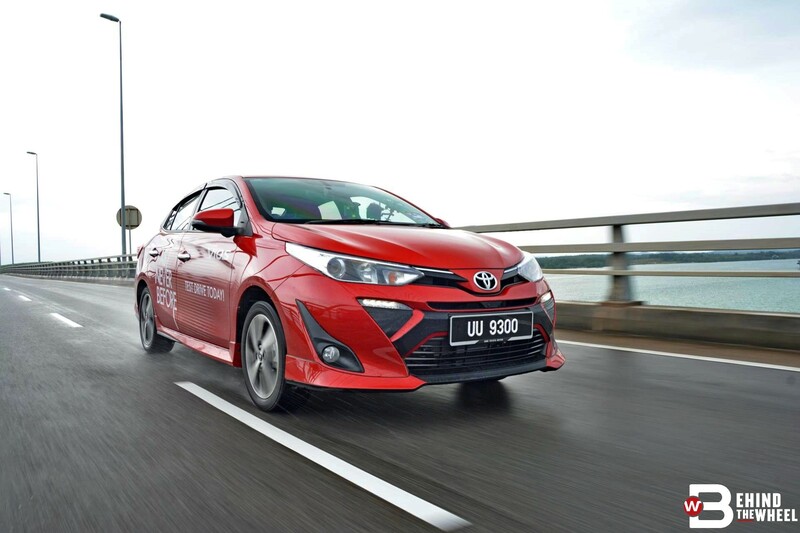 That’s all changed now as the Vios just about completes the marque’s revitalisation of its core models here that include the C-HR, Camry, Innova, Rush and soon-to-launched Yaris; the latter a much-needed B-segment hatch to take on the Honda Jazz. 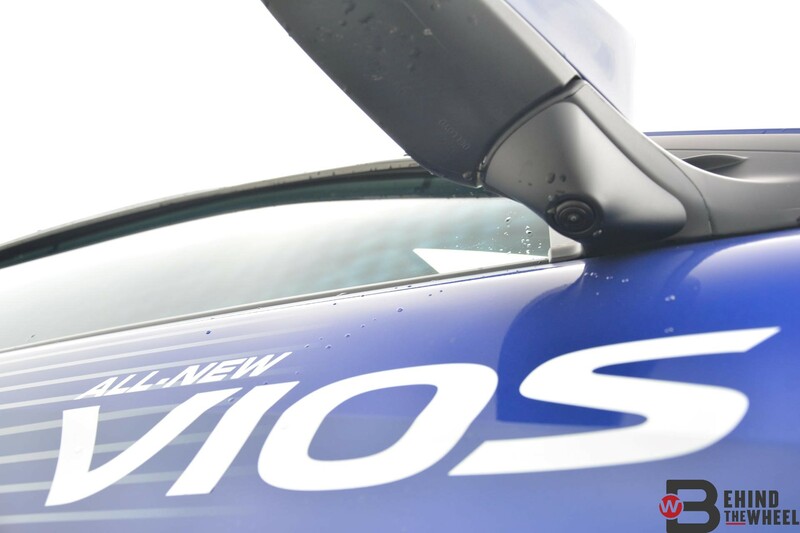 It’s best mentioned that even with all the significant upgrades, this isn’t a full-model change as the Vios still rides on the same platform of its predecessor and even shares the chassis code. 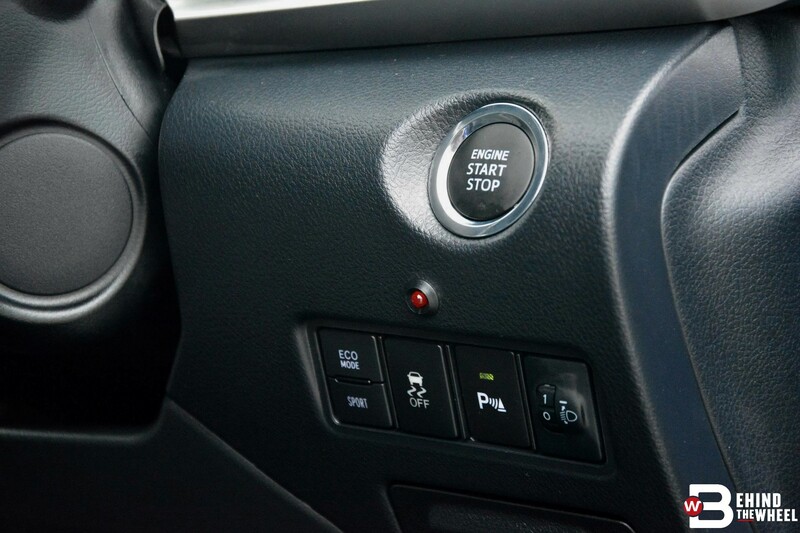 You should however keep in mind that everything except the engine and transmission have been upgraded. 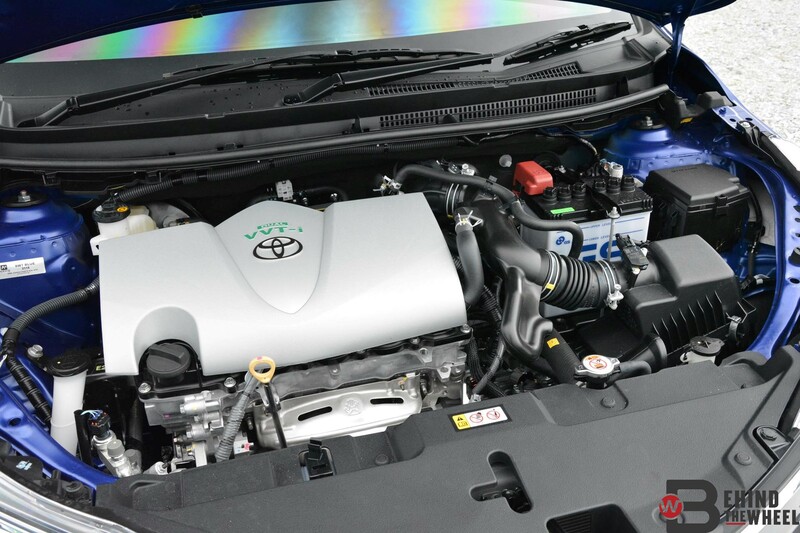 The two carry overs are the fuel-sipping 2NR-FE dual VVT-i 1.5-litre mill and the CVT box with seven virtual ratios. Power figures measure in at 106hp and 140Nm of torque. 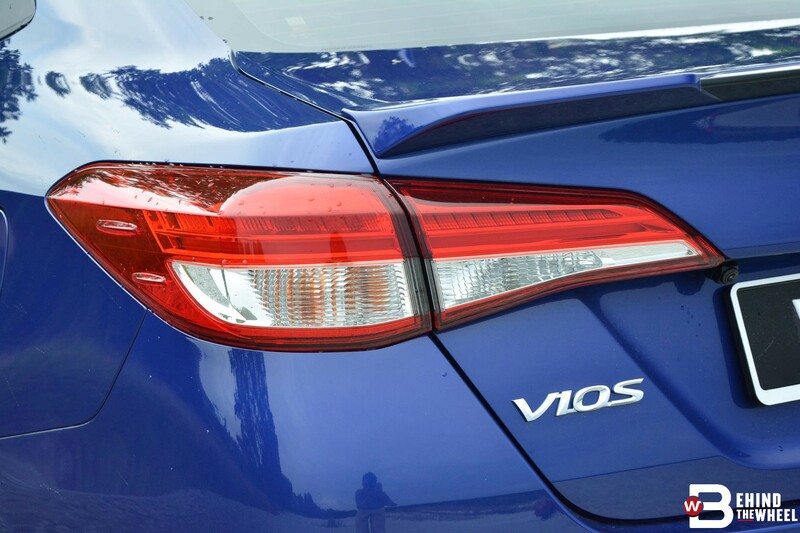 This Vios also marks the death of the five-speed manual variant as Toyota says the demand just can’t justify offering one. 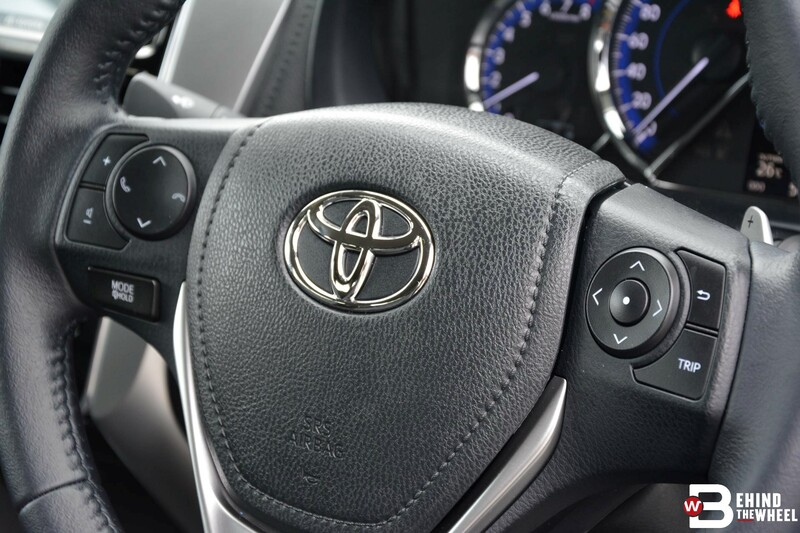 First impressions hold quite some weight and the Toyota has addressed that with a sharper exterior that slips into the suave suit of the current design language that tries a little too hard to mimic the sophistication of the C-HR and Camry. 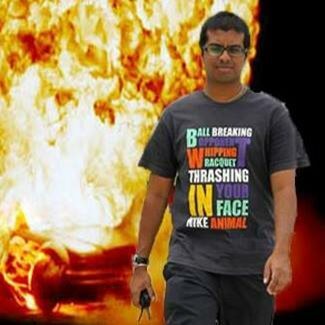 Frankly, busier is better than bland as that’s the image being shed. 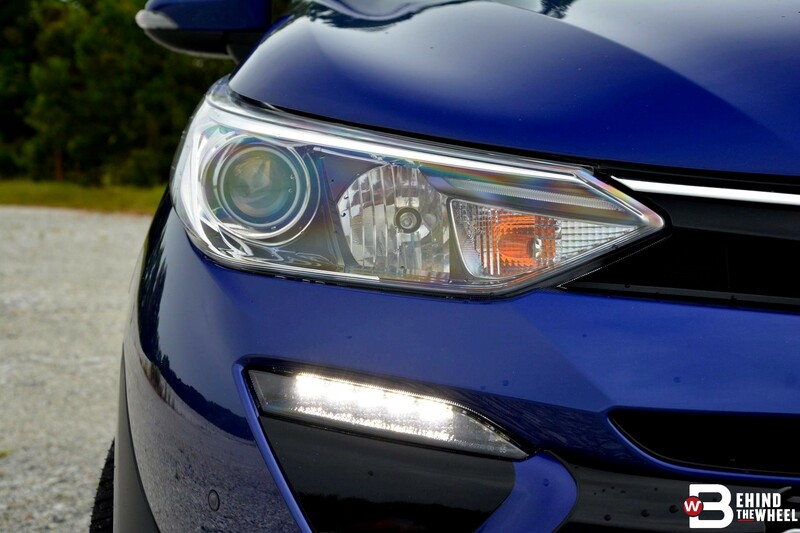 The important things are the integrated LED DRLs that aren’t an afterthought and the projector-type head lamps with follow-me-home functionality. At the rear, it’s even more Camry-esque and that’s no insult. 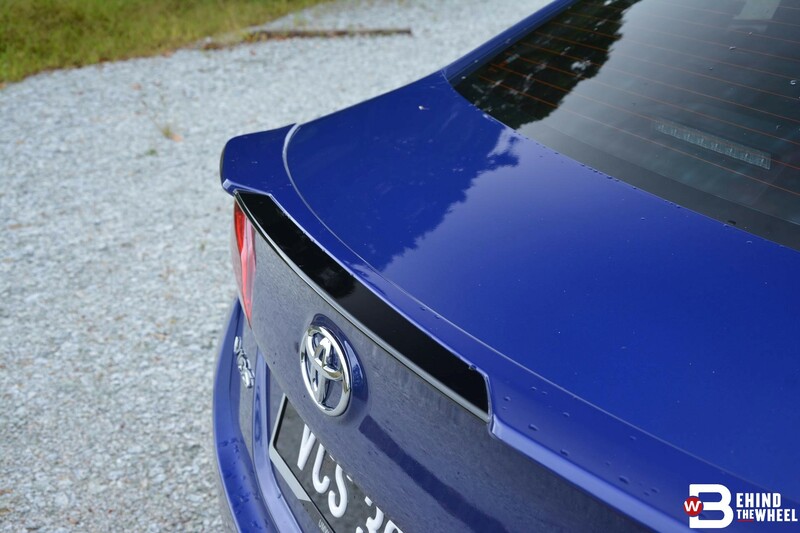 The taillights now take on an identity of their own with distinct LED light guides and there’s a little lip spoiler on the boot lid. 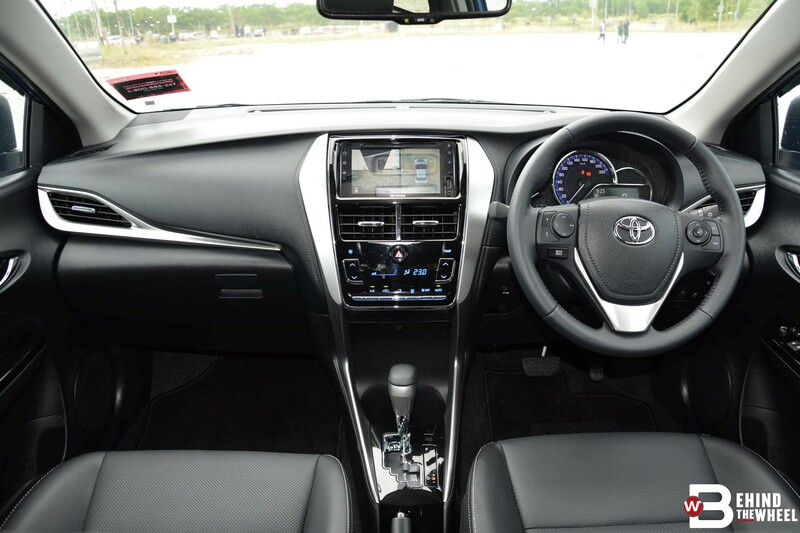 Plastic fantastic was the theme for the predecessor’s interior and Toyota have stepped up their game with the new cabin. All the materials are improved with high-contact areas benefitting the most from solid tactile feel. We’re also happy to report the demise of the faux stitching on the door cards. Good intentions they might have been to lend the interior some class, but if you can’t afford the real deal it’s often better to make do without altogether. Genuine white thread stitches actual soft touch material on the door’s armrests though the rest of it still very much subscribes to the plastic fantastic mantra. 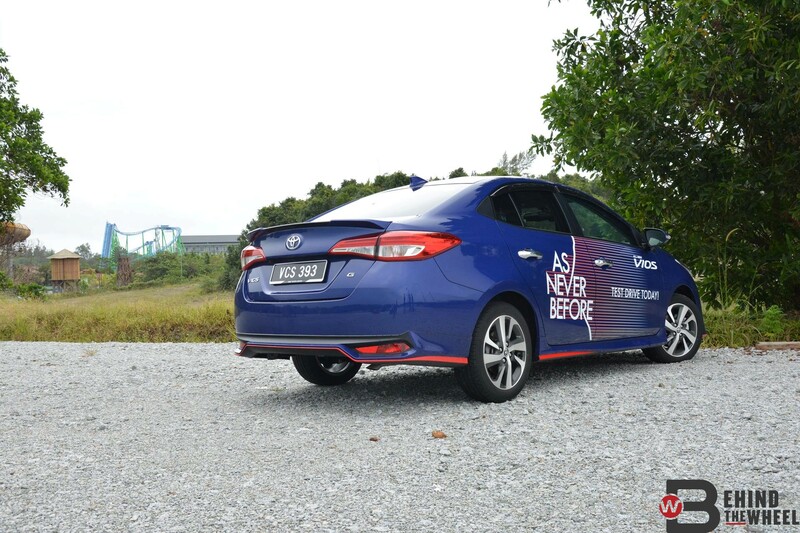 Cost-saving from the use of cheaper materials on low contact points can be applied to other areas of the car. Storage space and cubby holes has grown as well, with large bottle holders on the rear door and a bigger glovebox. That being said, it’s still lightyears behind the City in that respect. If we had to nitpick, the panoramic view monitor (PVM) switch placement is criminal. Sitting at the bottom let of the steering, it’s almost as if they don’t want you to find it. 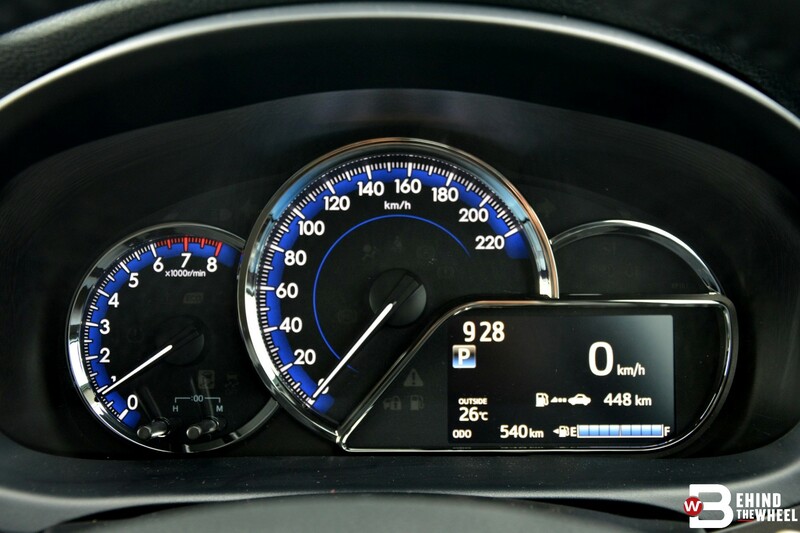 The Optitron instrument cluster houses a 4.2-inch colour multi-information display (MID) at the bottom right with the usual array of information available for selection. Air-conditioning is automatic although glaringly missing the front demister. 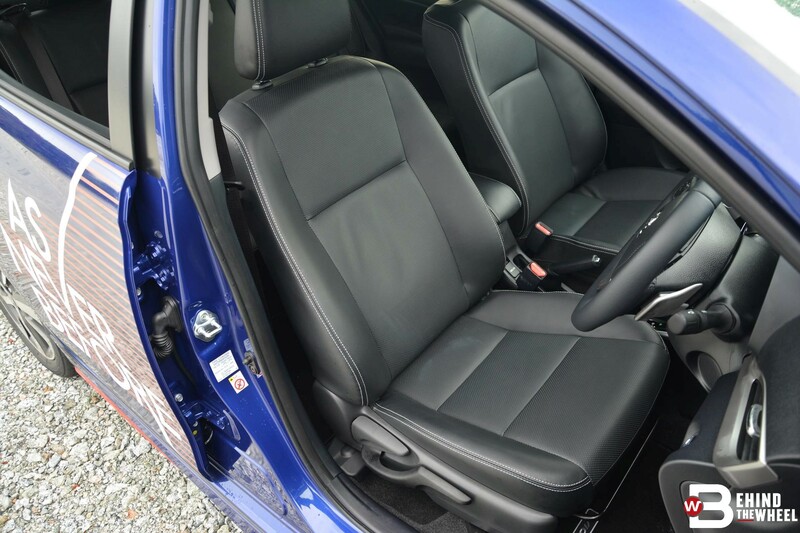 Rear occupants don’t get their own vents too but substantial time in the car demonstrated that the cooling capabilities of the front vents are more than adequate. 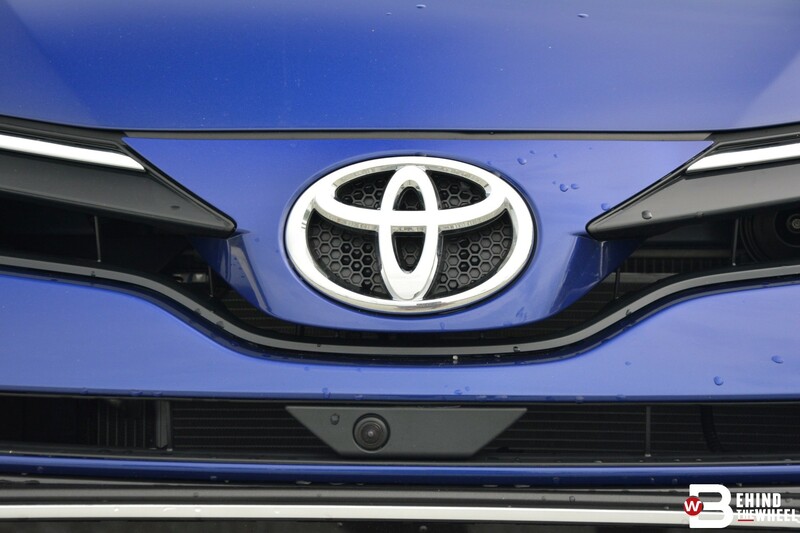 Remember all that money Toyota theoretically saved from using sinful hard plastics on low density touch points? Well, they slipped it into managing NVH levels. Cabin noise was incredibly low with minimal intrusions from wind and tyre noise at speeds up to 120kph. Generous applications of damping sheets and noise suppression material around the entire body truly isolates the cabin. Poke around the engine bay and you’ll notice the huge lump of noise suppressor on the wheel well. You can just about make it out in the engine bay shot here, to the side of the strut tower next to the battery. Furthermore, the entire shell was welded more rigidly to reduce NVH levels. 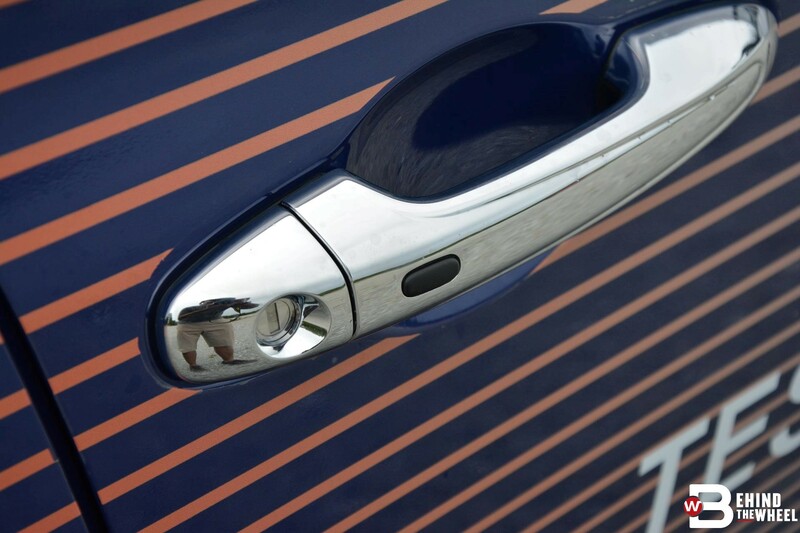 The hushed cabin does allow you to pick up on the small recalibrations done to the engine and transmission. It’s still a little underpowered and the CVT isn’t helping but against the previous car, it’s a step forward. 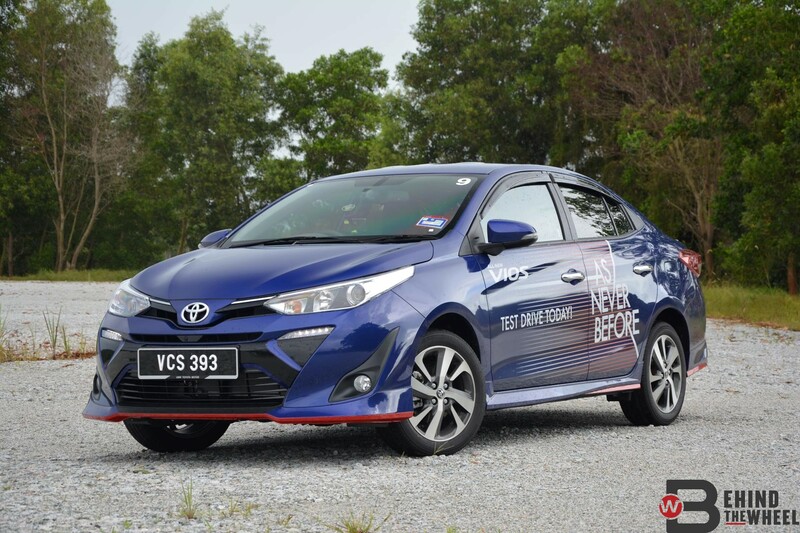 Response is improved and the CVT does a solid impersonation of an automatic by increasing engine revs step by step according to the seven virtual ratios. Sport mode further increases response and also holds the revs higher; keeping it closer to peak torque at 4,200rpm. It still lacks quite a bit of ponies over the City though. The Honda makes 118hp and that missing 12hp shows when you ask more of the engine. Ride and handling has also gained composure from some extra attention. Some precise finetuning on the suspension side complements the low NVH levels for a ride that belies its segment positioning. Safety wasn’t neglected as well. 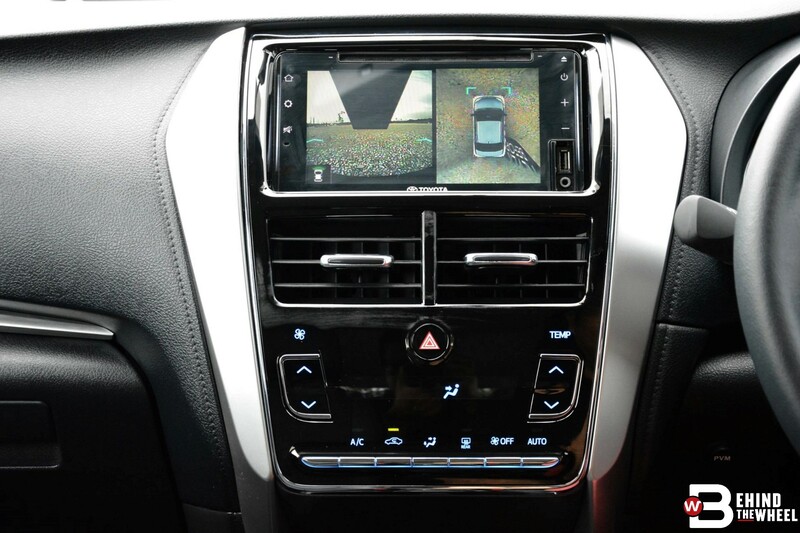 Standard all around are seven airbags, stability control, hill-start assist, Blind Spot Monitoring, Rear Cross-Traffic Alert (RCTA) and the panoramic view camera (PVM) that works as well as any other on the market. 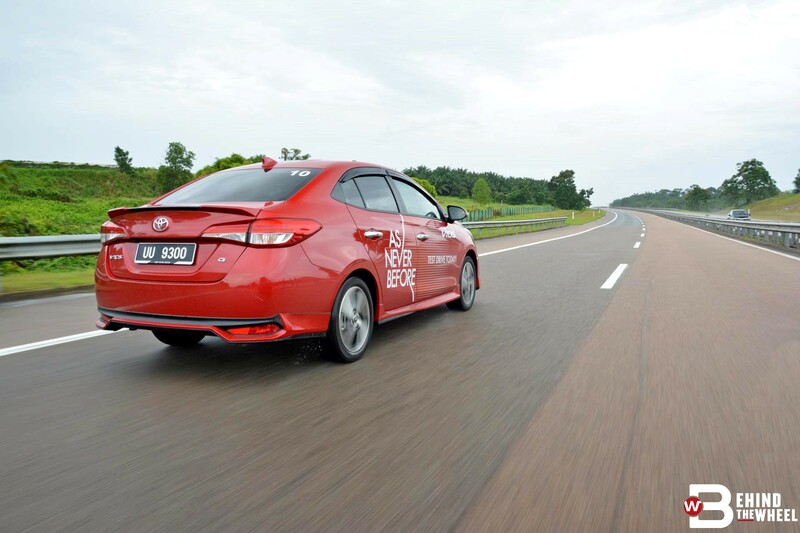 Toyota has finally given the Vios the arsenal it needed to take on the City. All the stops were pulled out and compromise was deemed profanity during the development. From playing catchup with the Honda, it’s now positioned itself as a more logical proposition although perhaps not the most fun. 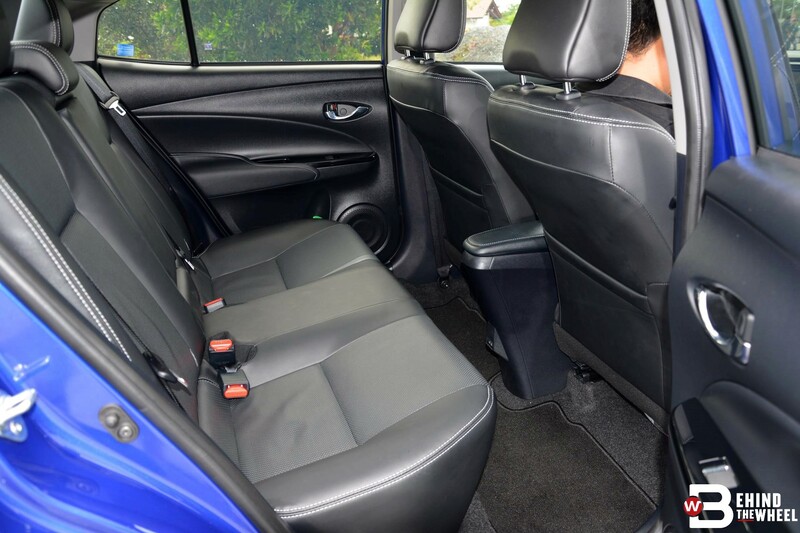 At RM87,300 for the highest G trim we drove, you’d be a fool to not give it a look if you’re shopping in the B-segment.